EME Systems TF precision temperature probes are field ready, cable-mounted transducers that produce an output voltage linearly proportional to the temperature present at the tip of the probe body. The probes can be easily used with any data logger or equipment that accepts a voltage input and require no linearization or special processing. 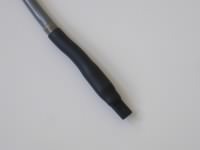 The TF Temperature probe covers 3°F to 225°F, at 10mV/°F. If desired, conversion to Celcius can be made by the user in data logger software or Excel. By entering into software a calibration value provided on a tag attached to the cable of each sensor, the accuracy is ±0.2°F (±0.1°C). Even without using the individual calibration data, the accuracy is still an impressive ±1°F (±0.5°C). Note that we also supply a parts kit to facilitate construction of your own temperature probes. The probes feature laser-trimmed solid state sensor elements (National Semiconductor LM34CAH/LM35CAH). 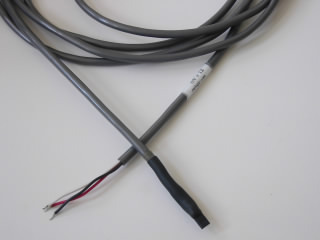 The sensor element is mounted on a cable and encapsulated in conformal thermo-plastic. The probes are robust and can withstand mechanical abuse and long-term immersion in hot or cold water without degradation of the calibration. They are protected against voltage surges and polarity reversal. The cable is 3-conductor, 22 gage, with a chrome PVC jacket. Standard TF probes are available in 10, 30 and 50 foot cable lengths, with custom lengths up to 500 feet. Operating temperature range: TF: 0-225 ºF. Cable: 3 conductor*22 gage, chrome jacket PVC, 0.17" o.d. Connections: stripped and tinned 22 gage stranded. The calibration tag gives the formula for calculating the temperature from the millivolts output of the probe. In this example, subtract 5 from the millivolts output of the probe, and then divide by 10, to find the result in °F. All TF calibration tags follow the same format. The calibration offset value can range from -10mV to +10mV. If need be, you can perform further calculations to convert units (to °C, °K) or to perform averaging, etc. Never expose your TF temperature probe to temperatures in excess of 230 ºF. Temperatures above this will soften the conformal thermoplastic probe tip. Note that the probe has an output resistance of 3000ohms.. The output resistance serves two purposes, 1) protection from lightning, surges and misconnection, and 2) isolation of the sensor element from cable capacitance. Most data loggers have a very high input impedance, relative to which the 3000ohm is negligible, e.g., it represents less than 0.03% error to a 10Mohm input meter or data logger. However, you should be aware of this factor in cases where the sensor might be connected to a meter or logger having low input impedance. Noise on the cable is usually not a problem in biological research settings. However, if the sensor cable runs in a conduit with power lines, or if it runs close to halide vapor lamps, etc., . noise may become a problem. Noise and power line coupling show up as fluctuating readings. Use of shielded cable, or filtering at the output, or alternate routing is recommended in such cases. Another possible cause of fluctuating readings is self-oscillation on the cable. The TF contain circuitry to dampen self-oscillations, but should they occur, a capacitor across the line between COMMON and signal at the data logger connection can usually suppress them. The TF sensors draw very little current, less than 100µamps. This current flowing on the COMMON lead generates a voltage that appears to be in series with the signal, a source of error that depends on the length of the probe cable. 300 meters of 22 gage wire has a resistance of 15 ohms, giving an error of 15*100E-6=1.5 millivolts, less than 0.15°F or °C error. This is negligible for most types of field monitoring, even given this extremely long cable length. Nevertheless, watch out for poor or corroded connections in the COMMON lead, which can have the same effect, and will degrade accuracy.